After a long period of vacancy in the swimming pool, it will grow moss on the wall (especially the gap between the tiles), so the swimming pool equipment must be thoroughly cleaned before using. It is best to use a swimming pool cleaner when cleaning to completely remove the growing moss, otherwise, it will be easy to regenerate and it will be difficult to completely remove it. When the new water starts to be poured into the swimming pool, as soon as there is a small amount of water in the swimming pool, the algaecide should be put into the water immediately. The dosage is calculated according to the total amount of the swimming pool water and added once (2kg per 1000 cubic meters). Make sure that the algaecide is diluted with water and evenly sprinkled in the pool. After the water is full (if the pool cannot be filled in temporarily, after adding the algaecide for 5 hours), add disinfectant powder or disinfectant tablets for disinfection. The dosage is calculated according to the total water volume of the pool. 4kg per 1000 cubic meters. When the time is over, the disinfectant powder is first dissolved in water and then sprinkled evenly. The disinfectant tables can be directly sprinkled into the pool. After the water is full (if the pool cannot be filled in temporarily, after adding the pool disinfectant for 3 hours), test the pH value. If it is lower than 7.2, please add pH adjuster to adjust the pH to 7.2~7.6. Adding 10 kg to 1000 cubic meters of water can Swimming increases the pH by one. 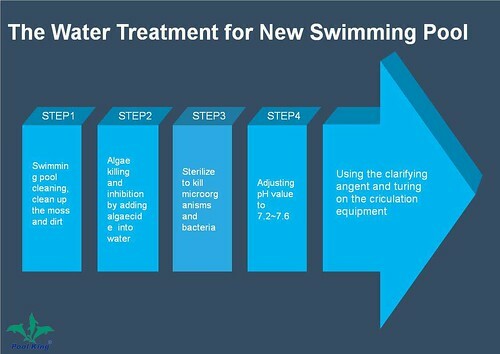 After the above steps are completed, the clarifying agent can be added for clarification treatment. The dosage is calculated by adding 1 kg per 1000 cubic meters. When adding, the clarifying agent is diluted with water and then sprinkled. At this time, the swimming pool circulation equipment must be on. The clarifying agent is formed by the adsorption of salt particles to form fine particles in the water to form slightly larger particles so that the water flows into the circulation system as the water flows, and the water is cleared by pool filtration system through the stainless steel sand filter. Poolking is a swimming pool pump supplier which can supply you swimming pool equipment such as stainless steel sand filter. Please contact us to have further information.